Operating on a Mach schedule, the Mach trim compensator pulls the First Officer’s control column aft as Mach number increases. 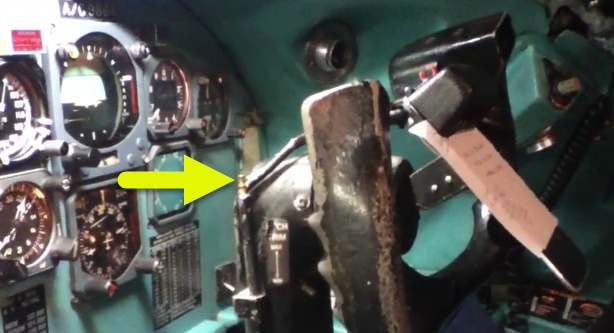 As the control column moves aft, an indicator rod on the left side of the First Officer’s control column extends, giving visual indication of Mach trim operation. Why don't the mentioned Mach trimmers use the stabilizer? I always thought the stabilizer had more fine control, not to mention the drag penalty of an offset elevator. There must be a reason for moving the control column aft and not just trim the stabilizer. Why does aircraft stability increase when it transitions from subsonic to supersonic flight? What are the advantages of a Trimmable Horizontal Stabilizer? I think it's because the 9 uses free floating elevators with servo tabs to move them. The columns just move the servo tabs which means the actual input forces are really low and there is feel spring unit in the system. For mach trim they just have a servo motor that applies a little pull to the column via the feel spring unit, and the rod extends to tell you the motor is pulling on the column. There is a trimmable stab for pitch trim, but it will have a fairly primitive controller (figuring pre-microprocessor 1965 electronics) and to incorporate a mach trim mode into the stab control system was probably much more expensive than the simple setup they came up with. The more modern setup, with hydraulic elevators that are always faired with the stab when not displaced by a control input, and a stab controller that is fully integrated into the autopilot and air data systems is way less drag. Not the answer you're looking for? Browse other questions tagged flight-controls stability transonic or ask your own question. Do the captain's and first officer's rudder pedals always move together? Why do some fighter jets have movable horizontal stabilizer instead of elevators installed on the stabilizers? Why don't we use elevator trim as the primary flight control? Why does elevator still raise and lower the nose when the aircraft is steeply banked?